Infinite Ideas. Infinite pieces of inspiration. This collection of novellas and short stories by Realm & Sands storytellers Johnny B. Truant and Sean Platt may not number into the infinite, but it does contain five stories that were co-created with readers, born live in front of readers, and borrowed from the inspiration provided by readers. It contains three exclusives, seen only by die-hards or never before at all. The remaining two tales are R&S classics with deep roots that fans watched bloom live. • “Decoy Wallet”: A paranoid, twisted, and hilarious journey through the mind of one disturbed man who's finally outsmarted someone with his wallet's failsafe: himself. • “Infinite Doors”: This grim, never-before-seen short tells the tale of a librarian at an intergalactic crossroads who finds herself trapped in alternate realities, lost and unable to find her way back to the maze's center. • “Caveman Timecop”: Previously unreleased except to the Realm & Sands mailing list, this improv mindbender tells the tale of a time enforcement officer marooned in prehistoric time with a nemesis on his heels. • Unicorn Western: The first project Platt & Truant ever wrote together and the start of an epic series, Unicorn Western began as a joke … and you'll learn why. 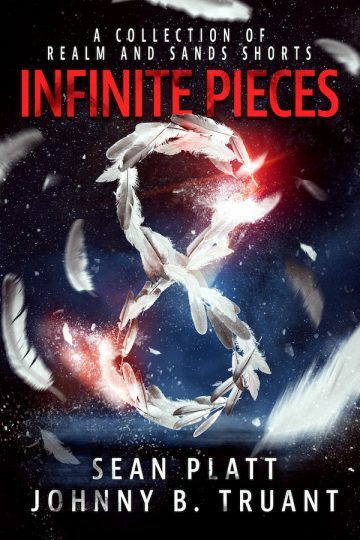 Don't miss Infinite Pieces. There's something here for everyone, and you never know what that piece will be.